I trained for four years at the world-renowned Institute for Optimum Nutrition, successfully completing the Nutritional Therapy Diploma Course (DipION). The institute, founded by Patrick Holford in 1984, is now the largest training school in the UK offering a degree-accredited training in nutritional therapy. My training included clinic-based consultations with both internal and external clients. As a qualified Nutritional Therapist registered with the Nutritional Therapy Council, I am trained in all aspects of nutrition and work with clients to help improve a wide range of health issues. I am a member of the British Association for Applied Nutrition and Nutritional Therapy (BANT), the professional body for nutritional therapists. As a BANT-registered practitioner, I have met the required standards in training, am fully insured and adhere to the BANT Code of Ethics and Practice. 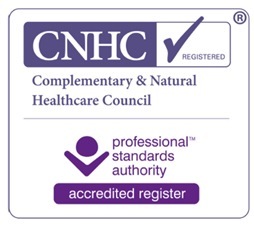 I am also a Registered Practitioner with the Complementary and Natural Healthcare Council, the UK regulator for complementary healthcare practitioners. The CNHC quality mark demonstrates that I conform to national standards of practice in my work, so you can choose with confidence when using my services. My approach to nutrition and to helping my clients is to provide a holistic but realistic assessment of their diet and lifestyle, and then to offer professional, practical, and down-to-earth advice that can help people achieve their nutritional goals. As someone who has worked in a fast-paced business procurement office environment for many years, I am well aware of the difficulties in following a healthy eating regime. However, a number of years ago I changed my diet and re-thought my lifestyle, and the benefits I realised from this made me keen to help others experience how optimum nutrition can help them reach their maximum potential. I am currently the club nutritionist for the semi-professional football club FC United of Manchester and have particular experience and specialism in sports nutrition. As well as my recent experience in procurement and reporting, I have also worked within HR and training, and hold the CIPD Certificate in Training Practice.